So far this has been a very hard blog to write, not 100 percent too sure why, but it may be because knowing that I have unknowingly contributed to the “slacktivism” movement makes a person look inward and take stock of themselves. So, where did the spark to write this post come from? Simple – it came from a tweet! @carlacoop @MrsMurray15 I'm guilty too! I often think it'd be better to not even know abt the issues but that's the opposite of effective. Thank you Lance and Ashley! According to the Urban Dictionary – A slacktivist is a “person who does simple things like change their avatar colour or post a status update about a cause instead of actively supporting the cause.” ALS ice bucket challenge, Pink and Red equals signs for equal rights in marriage. Avatar activism is not a bad thing, it does raise awareness on issues and does bring issues to light, reaching many people on social media in a very short time. But does it end there, with a re-tweet, changing the colour of your Facebook profile picture, wearing a bracelet in support of a cause that means a lot to the individual? The video below takes a look at the positives of having slacktivists in our society. Katherine Hudson points out that 5000 likes is worth more than one conversations. ONE CONVERSATION! 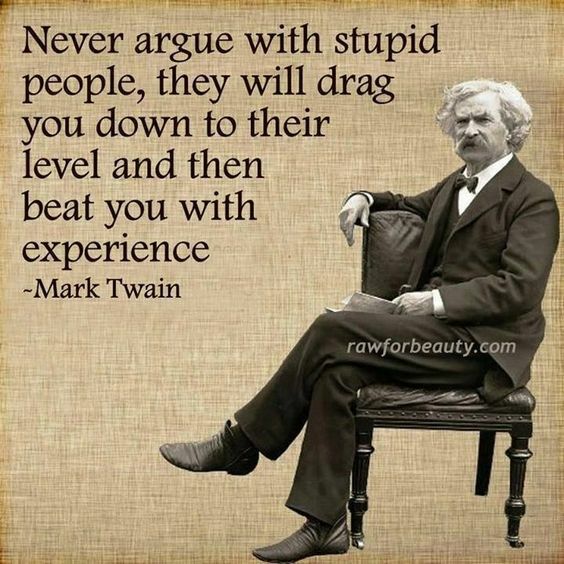 Again, this brings to mind the idea from Michael Wesch’s TED Talk knowledgable vs. knowledge-able. The evolution of using knowledge (knowing a bunch of stuff) towards a concept of being knowledge-able (find, sort, analyze, what can be said, who can say it, who hears what is said) which are used to start conversations. At 12:30 into his TED Talk, Michael speaks about a software used to send alerts to based on where you are to your cell phone – essentially creating 45,000 citizen reporters. These “reporters” were not physically doing anything, they were sending alerts, so are these “reporters” slacktivists? One last thing, and brining it back to Katherine Hudson; are slacktivitst disrobing us of our own opinions or are they educating and moving the tassel on the mortarboard from the right side to the left? Deeper connections – this is what I have been looking for, although I did not realize it at the beginning of my #edtech journey into #OER (open education resources). As I participated in the #etmooc chat on January of this year, I began to have a sense that a MOOC was where I wanted to venture in my major project. I am very interested in open education in the high school science classroom and want to further explore how a MOOC can help our students engage in the curriculum. Now, I realize that I still need to figure out fully what the word “engage” looks, sounds, and feels like – but this is an area that I intend to explore and expand in depth further into my thesis. But in order to begin to understand the focus of my thesis, I understood that I first needed to explore MOOCs a bit further. So far in the course, I have taken an xMOOC out for a “test drive”, and while it is a very good course, it is just that, a university style course, and not what I am personally looking for. It’s just that, a personal choice. I have been doing deeper research into cMOOCs, honestly, they just click with me. Do you ever have that moment? The moment when you know that you are on the right path because it just feels right? I finally have that feeling, and its great! A cMOOC, as I previously researched, is based on connectivism. 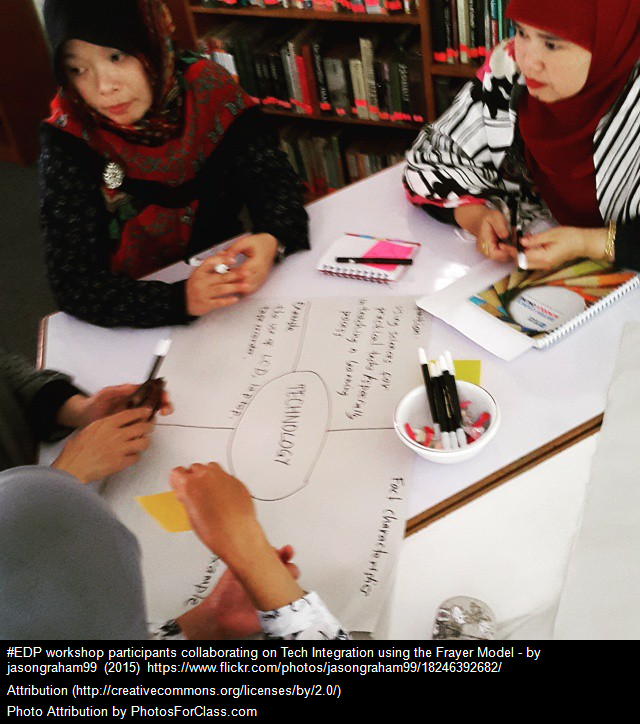 Just the word alone, connectivism, a community connected with one another, learning together clicks – this is the basis for my research and an opportunity I want to give to my students. Think of it as the ultimate peer tutoring if you will. I really liked the feel of #etmooc, created by Alec Couros (yes, the real Alec Courso), and was fortunate enough to have a brief glimpse of. Previous to the start of the #etmooc, Peter Rorabaugh had a chance to Twiterview Alec, it really is a very interesting “read” on how a course and a collaboration exists symbiotically. Here is a snippet of one of their meetings, they know each other by name and are genuinely happy to see one another and connect not only pedagogically, but personally. I think that Julie Balen captured the essence of collaboration and celebrations of #etmooc in her blog, Why Celebrate a Course? “it is the only learning experience I’ve had where openness, flexibility, lightheartedness, seriousness, collegiality, collaboration, creation, intellectualism, and generosity co-existed”. Really, what other course creates something as masterful as this? Geographically separated, yet not at all. #rhizo16 by Dave Cormier will be starting up May 10th? I have also found MOSOMELT , Mobile Social Media Learning Technologies, which seems to be based out of New Zealand, but the beauty of social media is that geography melts away during connectedness. This cMOOC begins March 14. Check out their website and Google+ community. 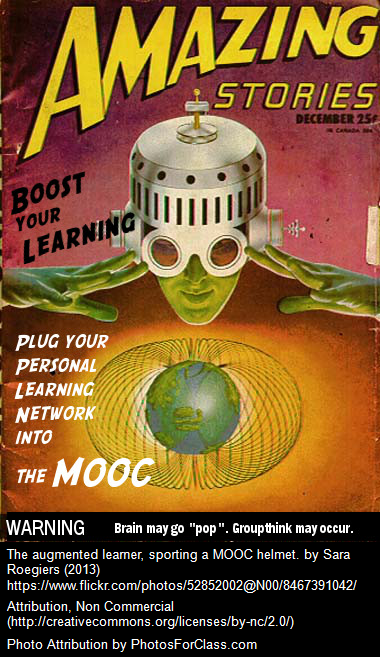 If you happen to know of a cMOOC starting up, please let me know, or better yet join me! 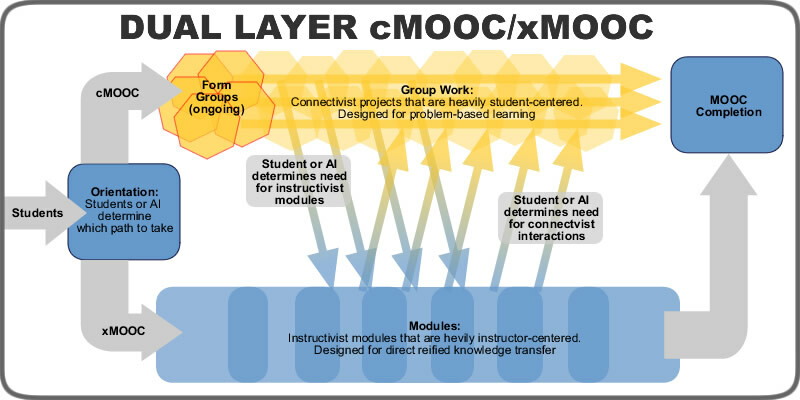 One last thing I will throw note; if you are someone who is new to MOOCs like I am and are unsure of which way to go, there is a “cross-breed” between the xMOOCs and the cMOOCs, the dual layer. It is something that I will investigate further, because you never know until you try. But for now, and believe me I am very new to this, a cMOOC just feels right. Author carlacoop1Posted on March 6, 2016 Categories 831 Major ProjectTags #edtech, cMOOC, digital citizen, dual layer mooc, MOOC, Open Education2 Comments on cMOOCs – Welcome Home! I have a confession – I have decided to continue with taking a MOOC alongside this course, but have made the decision to audit the MOOC instead, and I am happy that I have made this decision as I am still allowed to move through the MOOC and take part in all aspects of the MOOC, I just won’t receive the certificate. Sometimes, we need to make these decisions in order to maintain a work/school/life balance. I am realizing that there are a lot of people whom actually choose this route when participating within the MOOC community. Since this is an “off week” for my Learning to Read in Science MOOC (we have three weeks to complete 5 videos and I want to research what a MOOC is as well as what a MOOC feels like to participate in), I decided to further explore types of MOOC’s this week. Did you know that there are many types of MOOCs? If not, don’t worry, I didn’t either up until a few weeks ago. 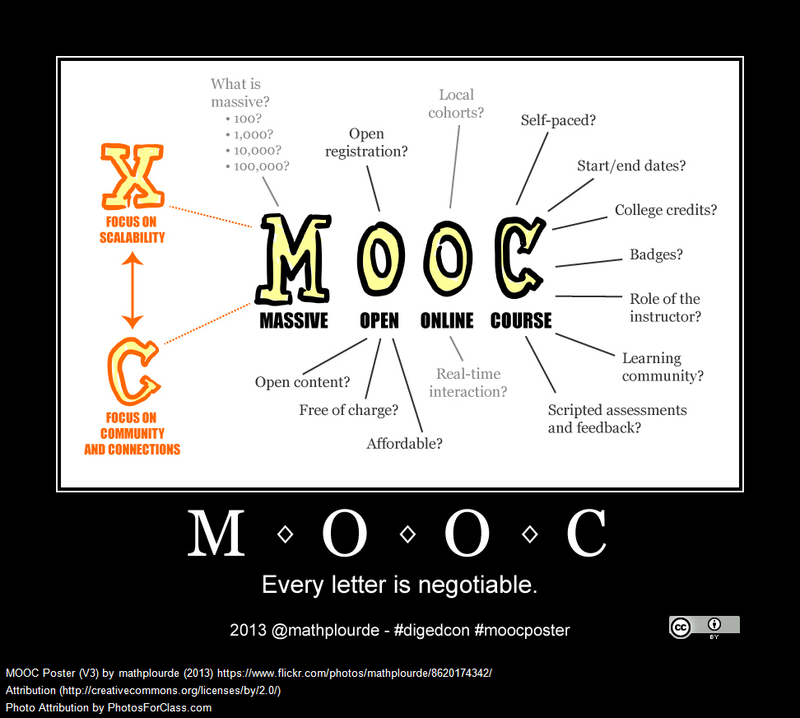 In this blog, I will be focusing on xMOOCs and cMOOCs. xMOOCs are designed and based upon academic courses and follow the behaviourist learning theory in which behaviours (or in this case knowledge) is learned. Most of the time these are courses in which the learner can earn a certificate or credits from an academic institution. 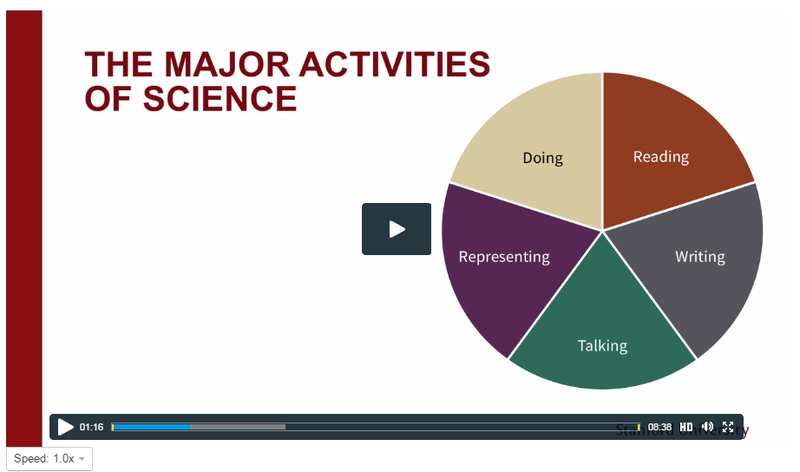 I am taking an xMOOC currently from Stanford University. These types of MOOCs are guided and organized according to the academic institution offering them. By offering xMOOCs, Universities can broaden the number of individuals taking a course at a time, thousands of people (even hundreds of thousands) can participate at the same time! These types of MOOCs usually follow a video format, with the lecturer posting several short lecture style videos (as mine is), these make up a “session”. Once the participant has completed the videos there are usually questions and assignments consisting of independent work and some connecting with others in the MOOC community. You may have very little to no contact with your instructor in this type of a MOOC due to the shear volume of learners participating. cMOOCs are based upon the connectives learning theory developed by George Siemens and Stephen Downes. Together, George Siemens and Stephen Downes launched the first cMOOC, Connectivism and Connected Knowledge. This theory is based upon the understanding that the starting place of learning is within the individual, then can be branched out to networks, which feed into organizations, these organizations in turn feed back to the networks and finally to the individual creating a cycle of learning. Learners participate through social platforms such as Twitter, Facebook and blogging. cMOOCs are not funded by a large corporation, rather they are organized by individuals with similar interests in a content area. 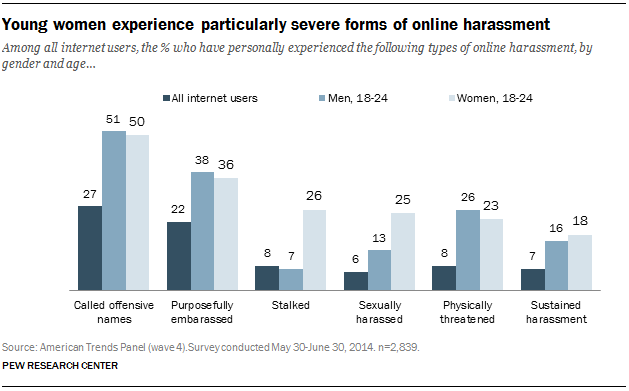 Participants in this type of MOOC communicate and use social media as a driver for each individuals learning experience. cMOOCs focus less on the presenting content and more on connectivity. One example of a cMOOC is Dave Cormier Rhizomatic Learning. After researching what I consider to be the two main MOOCs, I have to say that I am a little disappointed to discover that I had unknowingly registered in an xMOOC and now realize that what I was really looking for was a cMOOC. I am still happy that I am participating in a MOOC, and really, knowing the type of MOOC I am in explains why there has been no collaboration amongst leaners. I will continue my course, but will begin looking for cMOOCs as I want to have the experience of both. 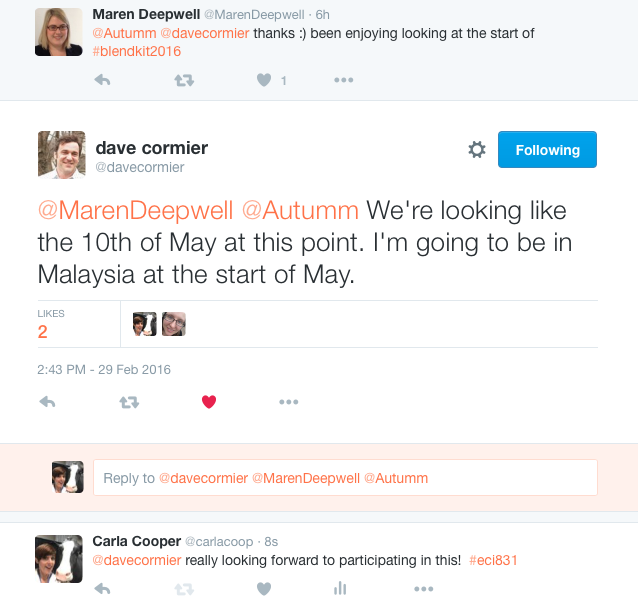 Doing some quick searches on Twitter, I found that Dave Cormier will be beginning his #rhizo16 MOOC May 10! Join me! 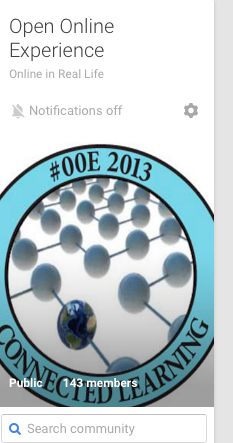 I was also able to find an open online Google+ Community, which I will spend some more time exploring. Author carlacoop1Posted on March 1, 2016 Categories 831 Major ProjectTags #edtech, cMOOC, ECI831, Open Education, xMOOC2 Comments on More than one MOOC? Science – the “Mother” Subject? Pre, During, Post reading strategies. I bet there isn’t one of us in #eci831 that does not know or has not employed these strategies in their classes…. Well, as a science teacher I had used them, but I am quickly learning that I had not been using these strategies properly. In the second MOOC session of Reading to Learn in Science we are studying these strategies and breaking them down further in regards to employing them within the science classroom. in science we use the math skills that students obtained from math class and apply those skills to science. For example, we use SOA CAH TOA to solve vectors in physics 30 (without the math skills how would a pilot ever fly a plane, or a captain sail a ship, etc. ), we use conversion factors for all classes of science, we use quadratic equations for physical science classes, we collect and analyze data quantitatively…. so thank you math teachers. in science we use the physical activity skills learned in phys ed and demonstrate how those skills would not be possible without Health Science understandings… we also use those skills in completing some laboratory activities and demonstrations. in science we rely on historical understandings to propel further research into current or new areas. We learn from others and build upon their discoveries. For example, the new Biology 30 curriculum is based around genetics and evolution….need I say more? Now, some may be thinking, but I teach subjects that are not mentioned…well, science is related to those as well. And many will argue (as you should) that your subject is the one in which all others are linked to…I happen to think that my subject does the best at amalgamating all other subjects into one. But there is one other subject which science may rely on the most in order to make this amalgamation happen; reading! In order to successfully achieve the objective: pre, during, and post reading strategies are used to engage students in the text that they are reading. Examples of pre reading strategies include picture walks, anticipation guides, and the Frayer model. This MOOC session really concentrated on the use of anticipation guides as a pre and post reading strategy. It is important the the teacher does not copy down the claims word for word from the text as this will activate prior knowledge from the students (allowing the teacher to gather data on the amount of retention that the students have) as well as eliciting inferences about the text. Another important piece to remember with anticipation guides, is that not all claims are to be true – placing false claims in is beneficial, especially during class discussions. Once all claims have be completed by the students individually, ask the students to break up into small groups or as a class have a discussion about each claim and what the students initially thought of each. DO NOT ALLOW THE STUDENTS TO CHANGE THEIR ANSWERS, I have posted an example of an anticipation guide from the session – however, I would change this guide a bit and add another column in to allow students to write down information gathered from class discussions. The example strategy that was taught during this session was DART (Directed Activity Related to Text) in which students selectively highlighted text used to slow down the reader and to force the reader to think about what they are reading, and to promote reflection and rereading. 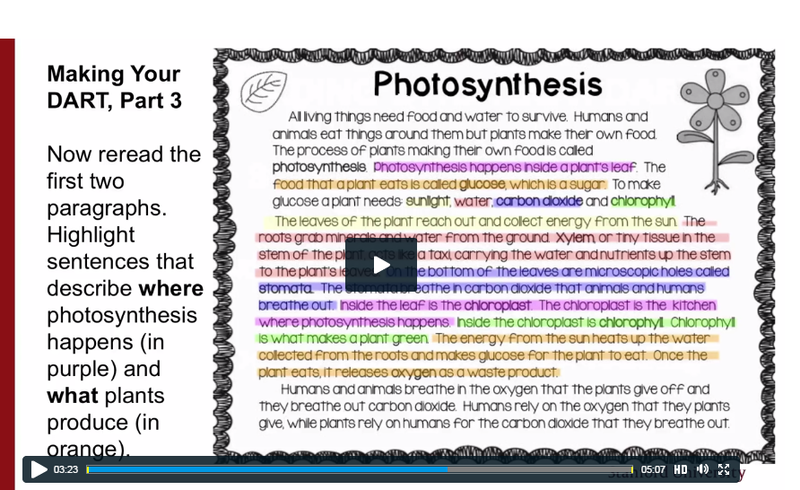 Highlighting is done using different colours to categorize content (see screenshot). Anticipation guide – ask students to re-read each claim and now answer the columns “What the Text Tells Me” and what “Evidence” is given to support or debunk this claim. Frayer Model is a graphic organizer which helps the students gain a more thorough understanding of a concept and it’s applications. The Frayer model is good at helping students organize and summarize information, correcting misconceptions that the students may have, and helps the student to incorporation prior knowledge into the objective. The Pre, During and Post Strategies are helpful to identify student misconceptions, give students practice in citing evidence but they do require careful planning on the teachers behalf. So, in the end, Science may rely on the students ability to read, but I still believe that it is the one subject amalgamates all other subject into. After all, if you are going to read, why not read scientifically! Author carlacoop1Posted on February 20, 2016 February 20, 2016 Categories 831 Major ProjectTags #edtech, ECI831, MOOC, reading strategies, scientific literacy2 Comments on Science – the “Mother” Subject?